Major depression is one of the most common medical disorders in the United States. Many people go untreated or have trouble finding medications that work. But there’s a newer treatment that’s literally tapping into a patient’s brain to ease the depression without serious side effects. This treatment called transcranial magnetic stimulation, or TMS, changed a local mom’s life around. We’ll call her “Gina” because she doesn’t want to reveal her identity due to the stigma associated with depression. However, she does want everyone to know her story in the hopes of helping save someone else. Gina said she tried medication, counseling and self-help books. None of it worked. She said unless you’ve experienced depression, you can’t imagine what it feels like. She even admitted that she tried to take her life more than once. “Unfortunately, I did attempt. Once you get to a place where you’re not thinking rational and you think that people would be better off without you,” Gina told News4Jax. She described it as “unbearable physical pain” that’s not just in your head. “I turned to alcohol and started drinking a lot. That’s what brought me here. I ended up having to go into treatment for it,” said Gina. Dr. Marcus DeCarvalho, a psychiatrist at HPR Treatment Centers, believed Gina would be a good candidate for TMS. In a desperate, last ditch effort to ease her depression, Gina decided to try it. 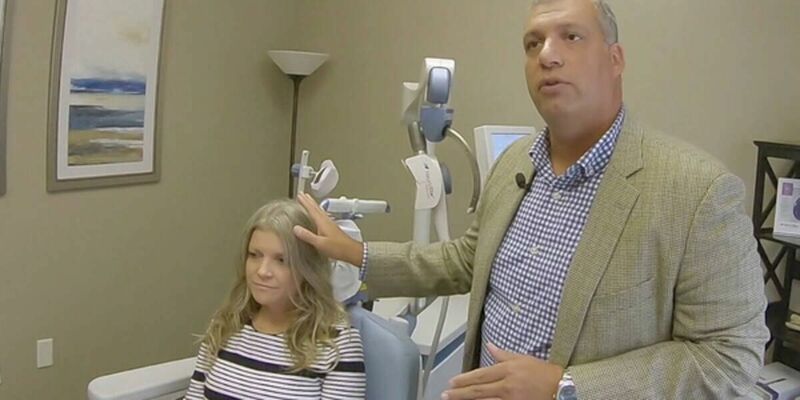 Dr. Marcus DeCarvalho described the non-invasive transcranial magnetic stimulation procedure as if you are waking up dormant areas of your brain. DeCarvalho said just months ago, before Gina began TMS, she was a shell of the person she is today. “We’re talking about a person who could not even get out of bed in the morning. She had significant depression and feelings of guilt, worthlessness, hopelessness and no appetite. She couldn’t sleep at all. She also had massive anxiety and racing thoughts,” said DeCarvalho. Gina said TMS started to work after 10 short treatments over two weeks. DeCarvalho said that 45 percent of patients go into complete remission after TMS. He explained that 65 to 75 percent of patients respond well to it, but might need follow-up treatments in the future. He said the partnership between a patient’s current doctor and the person administering TMS is important in order to make sure the patient gets the right prescription and has the right follow-up care. Gina’s prescription was 36 treatments spread over five days a week. And, it turns out, her insurance covered it. According to the National Institute of Mental Health, in 2008, the Food and Drug Administration approved transcranial magnetic stimulation as a treatment for major depression for patients who aren’t responding to at least one antidepressant medication.